For many who are struggling to conceive a baby, the practice of acupuncture, a form of Traditional Chinese Medicine (TCM), has proven to be a successful enhancement to Western reproductive protocols such as In Vitro Fertilization (IVF). While not universally accepted, over the past decade, the number of fertility specialists who publicly acknowledge the benefits of this age old practice has skyrocketed. Acupuncture refers to the administering of disposable, one time use needles which are hair- fine and flexible. These needles are inserted into specific areas of the body which are lined up along pathways called meridians. Meridians exist both on the inside and outside of the body. The needles remain in place for a short period of time and most women report that little, if any, discomfort is associated with the process. The underlying theory is that when meridians are needled, bodily functions can be regulated, and thus corrected. Researchers have identified that acupuncture causes the body to release beta-endorphins and enkephalins in the brain and spinal area. When these natural opioids are released, hormonal and other bodily systems are better regulated and the person being treated becomes more relaxed. In addition, acupuncture is known to increase blood flow, which stimulates the ovaries to produce healthy eggs as well as enriching the endometrial lining, thus supporting implantation. One way in which acupuncture differs from traditional fertility treatment is an ideological one. Traditional Chinese Medicine (TCM) represents a holistic approach to health, meaning that the whole body, not just the reproductive organs, is taken into account. For example, in TCM, the kidney is considered to be the internal organ responsible for the reproductive cycle, including growth, and also the aging process. If kidney energy becomes depleted by, for example, poor diet or stress, one of the possible outcomes is thought to be infertility. While acupuncture does not offer a cure for specific types of infertility, it may be of great benefit to individuals who are currently trying to conceive either naturally, or through the use of various forms of assisted reproductive technology, including IVF. Recent studies show a number of benefits among patients who received acupuncture during their IVF cycles, including stress reduction, relaxation, regulation of menstrual cycles and emotional stamina, as well as greatly enhanced psychological coping. If you decide to fold acupuncture into your treatment protocol, be sure to let your current physician know of your decision. Also, make sure that your acupuncturist is apprised of any assisted reproductive technologies you are currently pursuing. The acupuncturist you choose to care for you should be one that is licensed and well versed with acupuncture fertility treatment. It may also make your life easier if your acupuncturist and physician know each other and routinely share patients within their practices who are trying to conceive. There is much anecdotal evidence that those who found themselves unable to get pregnant through IVF alone, as well as others who were unsuccessful getting pregnant through the use of acupuncture alone, found that the combination of the two systems worked together beautifully and that they were finally able to achieve the success that eluded them before. Attain Health Desk. 30 November 2010. http://www.attainfertility.com/article/acupuncture-fertility. “Acupuncture Enhances IVF.” Available at: http://acutakehealth.com/acupuncture-enhances-ivf . 12 November 2010. 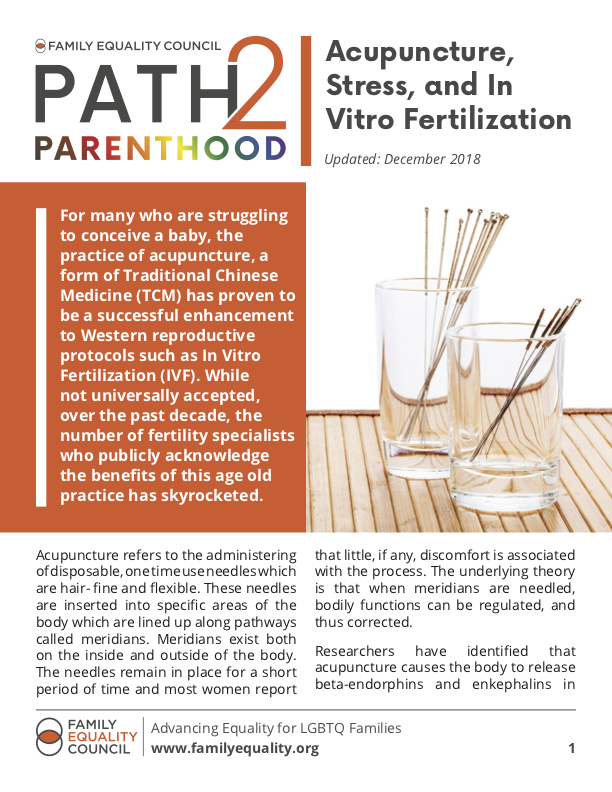 “Acupuncture for Fertility – Different Technique for Help Getting Pregnant”. Available at: http://health.ezinemark.com/acupuncturefor-fertility-different-technique-for-help-getting-pregnant-31ba5d99236.html. 30 November 2010. Available at: http://nccam.nih.gov/research/results/spotlight/020808.htm. 12 November 2010. “American Academy of Medical Acupuncture.” Available at: http://www.medicalacupuncture.org/acu_info/generalinfo.html.29 November 2010. Andersen, D., Lossl, K., et al. “Acupuncture on the day of embryo transfer: a randomized controlled trial of 635 patients.” Available at: http://www.ncbi.nlm.nih.gov/pubmed/20638338. 28 November 2010. Attain Fertility Health Desk. “All About Acupuncture Infertility Treatment.”Available at: http://attainfertility.com/article/acupuncture-infertility-treatment. 1 December 2010. Attain Fertility Health Desk. “Does Acupuncture Boost Fertility? Celine Dion Tried It.” Available at: http://www.attainfertility.com/article/acupuncture-fertility. 22 December 2010. Balk, J., Catov, J. et al. “The relationship between perceived stress, acupuncture, and pregnancy rates among IVF patients: a pilot study.” Available at: http://www.ncbi.nlm.nih.gov/pubmed/20621276. 15 November 2010. Berger, Carolyn and Hsieh, Mei-Sang. Telephone interview. 1 November 2010. Bovey, M., Lorenc, A. “Extent of acupuncture practice for infertility in the United Kingdom: experiences and perceptions of thepractitioners.” Available at: http://www.ncbi.nlm.nih.gov/pubmed. 29 November 2010. Clapp, Diane. “About Infertility Treatment from Alternative Practitioners. Available at: www.resolve.org. 27 November 2010. El-Toukhy T., Khalaf Y. “A new study of acupuncture in IVF: pointing in the right direction.”Available at: http://www.ncbi.nlm.nih.gov/pubmed/20650689. 27 November 2010. Kovarova P., Smith C.A., et al. “An exploratory study of the effect of acupuncture on self-efficacy for women seeing fertility support.” Available at: http://www.ncbi.nlm.nih.gov/pubmed/20832766. 29 November 2010. Available at: http://www.ncbi.nlm.nih.gov/pubmed/20959311. 29 November 2010. Magarelli, Paul, Cridennda, Diane. “Acupuncture in IVF: How East Met West.”Available at: http://summitacupuncture.net/attachments/File/Acupuncture-in-IVF-1240075677.pdf . 26 November 2010. Moy, I., Milad MP, et al. “Randomized controlled trial: effects of acupuncture on pregnancy rates in women undergoing in vitro fertilization.” Available at: http://www.ncbi.nlm.nih.gov/pubmed/20646688. 23 November 2010. Tanaka, Tim. “Infertility Treatment FAQ.” Available at: http://www.acupuncture-treatment.com/infertility_faq.html. 1 November 2010. “Treating Infertility using Acupuncture” Available at: http://www.americanpregnancy.org/infertility/acupuncture.htm. 29 November 2010. Whelan, Corey. “East meets west and ivf success rates benefit.” Available at: http://www.examiner.com/infertility-miscarriage-innational/east-meets-west-and-ivf-success-rates-benefit. 29 November 2010.